Listen to the debut of my sports radio show “The 5th Quarter in New York Sports” that aired Sunday September 16th on 1240AM-WGBB. Me and my co-host Ty Hardamon discussed the Giants comeback win, the Jets loss in Pittsburgh, the rest of the NFL games, and the Yankees playoff chase. 09/16/2012 – The 5th Quarter of New York Sports. I covered the Mets-Nationals game at Citi Field on September 12th with SportsRadioNY and AM1240-WGBB. Matt Harvey took the hill for the Mets in his second to last start of the season. This is the feature story I did on Harvey featuring Terry Collins’ post-game comments on the Mets young pitching phenom. The terrorist attacks on the World Trade Center 11 years ago is something that will never forget. The memory of this disastrous day in our country is still on the minds of many as the Hofstra community remembered 9/11 on Tuesday. “It’s a tragedy no matter who you are as an American…it’s a tragedy for anybody whether you have family or not and it’s sad,” said Lieutenant Colonel David Daniel. Lieutenant Colonel Daniel is the professor of military science for Hofstra University’s ROTC program. He is a part of this remembrance ceremony at Hofstra every year as a way to remember what happened and how it changed us and the rest of the world. Hofstra students were on hand with most just being around ten years old at the time of the terrorist attacks. Most students at the time were in school on 9/11, which happened to fall on a sunny Tuesday morning as well. School was exactly where Hofstra senior, Harrison Knowles was as he recalled the memory of his morning of September 11, 2001. Knowles described the importance of never forgetting what happened on that tragic day. 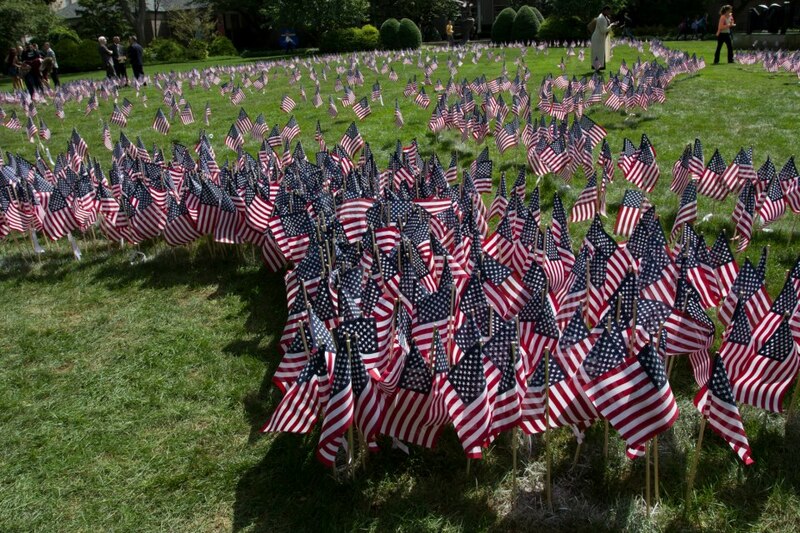 Hofstra students planted USA flags at the courtyard outside Brower Hall in honor of September 11th. Flags were placed in an outlined border of the map of the United States of America. Most of the flags were placed in the area of New York on the map. While many of the Hofstra students might have been too young to realize the magnitude of this, the memory of that day is still fresh in the minds of all of them. Tuesday was no ordinary sunny summer day on Hofstra University’s campus. It was a day of remembrance for those we lost on that same sunny Tuesday afternoon 11 years ago. It is important that the future generations continue to remember and pass on what happened and how our country has grown from it. There are no amount of years that go by where honoring 9/11 will become a thing of the past.